I sent Scotty a ’57 Stratocaster neck that was in very bad shape and his nitro refinish job was accurate and clean. Scotty is a real expert and always delivers high-quality craftsmanship at a fair price. This is the result of a beautiful finish Scotty did on my guitar. He matched the color sample I sent him to perfection. I currently have another guitar body on its way for a Butter Scotch Blonde finish and will be sending him all my work to him for finishing. He is meticulous and does excellent work at a very fair price. Scotty has built, finished and/or counseled me on 14 guitars and 1 Bass. I cannot say enough about his talent and skill-set. He is at the very pinnacle of the Guitar finishing field. Simply put, Scotty’s sense of color and finish detail is as good as it gets. He has tackled every difficult request I made of him, always well exceeding my expectations. His vast knowledge of Vintage Coloring and Master Finishes are not only encyclopedic, but are flat-out Dead-on! After he did the first Stratocaster for me, I was hooked. He did 5 more after that as well as 4 Telecasters, 3 Tele-masters and one Jazzmaster hybrid, and 3 Custom builds. All of these have become my treasured guitars and have become my go-to guitars. 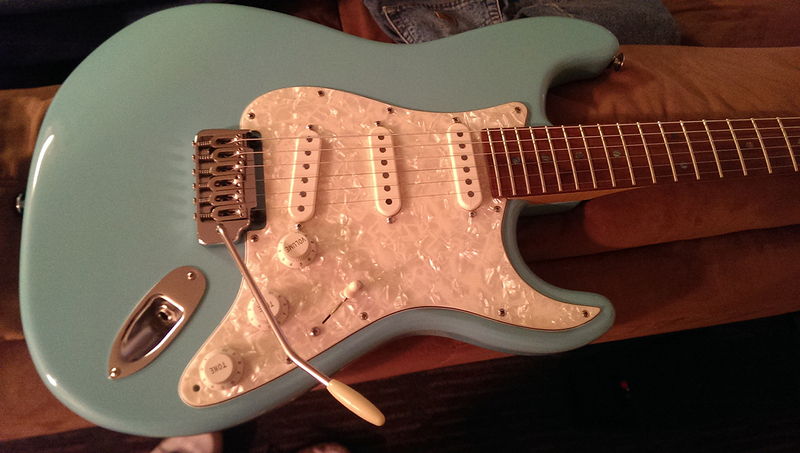 I am in the planning stage for another Stratocaster right now. I have been playing for more than 30 years, both professionally and just for my Soul and have owned many dozens of Guitars… The Strats he has done for me are some of the best Strats I have ever played and believe me, I have owned and played many. I think he can do this because he is a damb fine player himself. To reach the high level that Scotty produces, he would have to have an intimate personal relationship to the music the instrument actually produces. The Sound… The Feel… The Vibe… and The Look… Scotty produces some of the best consistently exceptional finishes and instruments that you can get. A real treasure!